The San Jose Sharks have already exceeded regular-season expectations by winning the Pacific Division. They'll now try to build some momentum for the playoffs when they meet the slumping Phoenix Coyotes on Sunday at HP Pavilion. It seemed unlikely that San Jose (47-21-10) would emerge as the division winner last month, when it was mired in a season-high five-game losing streak that dropped it nine points off the lead. Those struggles, though, seem far behind now as the Sharks have since gone 16-0-2, recording their last regulation loss in New Jersey on Feb. 20. San Jose, guaranteed home-ice through at least the first round of the playoffs, came away with its first Pacific title since 2003-04 by defeating defending division and Stanley Cup champion Anaheim 3-1 on Friday. Jeremy Roenick scored the go-ahead goal in the second period, and Joe Pavelski had three assists for the Sharks, who ended Anaheim's franchise-record 10-game home winning streak. "Our guys were focused," left wing Jody Shelley told the Sharks' official Web site. "We knew what we wanted to do here (Friday night). We came here, we had a plan and it worked out the way we wanted." With the second-best record in the NHL, the Sharks can still challenge Detroit for the Presidents' Trophy. Both clubs have four games remaining and are separated by five points. On Friday, Brian Boucher made 23 saves to improve to 3-0-1 with a shutout and a 0.90 goals-against average in four starts since signing with San Jose on Feb. 26. Sharks coach Ron Wilson might have Boucher start against Phoenix (37-35-6) to give Evgeni Nabokov a rest heading into the postseason. "Now we've got four games where some guys need a little break," said Wilson, whose team is making its fourth straight playoff run. "Like Joe Thornton, Brian Campbell and people like that, you can take their minutes down and give other guys opportunities who haven't been playing much to get in there and get themselves ready for the playoffs." Nabokov, who has an NHL-leading 44 victories in 73 starts, is 4-1-1 with three shutouts and a 1.77 GAA in seven games versus the Coyotes this season, while Boucher is 1-2-2 with a 3.95 GAA in five career games against his former team. Nabokov allowed four goals on 26 shots in the teams' most recent meeting before Boucher gave up the game-winning score in a 5-4 overtime loss at Phoenix on Tuesday. Thornton, who tops the league with 65 assists and is fifth with 91 points, registered his first hat trick this season - the third of his career - and had an assist in that matchup. San Jose, which has won five of its last six overall, is 4-1-2 against Phoenix in 2007-08. On Thursday, Phoenix lost for the sixth time in seven games, 4-0 at Los Angeles. Mikael Tellqvist made 29 saves as the Coyotes dropped six points behind the eighth and final playoff spot. "We came out and played a pretty good first period, and then laid an egg in the second and third periods," defenseman Ed Jovanovski said. "We hung our goalie out to dry, and that's unacceptable." Phoenix, which plays three of its remaining four games on the road, has lost four of five at HP Pavilion, where San Jose has won six of its last seven contests. 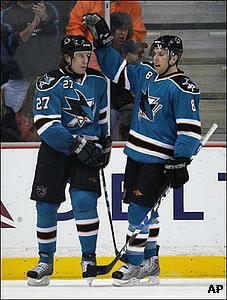 The Sharks last won four straight home games during a seven-game run from March 11-April 5, 2007.